In a closed system with liquid and vapor, evaporation continues until as many molecules return to the liquid as escape from it. At that point, the vapor in the system is considered saturated because it cannot absorb any more molecules from the liquid. Saturation pressure measures the pressure of the vapor at that point that evaporation cannot increase the number of molecules in the vapor. Saturation pressure increases as temperature increases since more molecules escape from the liquid. Boiling occurs when the saturation pressure is equal to or greater than the atmospheric pressure. 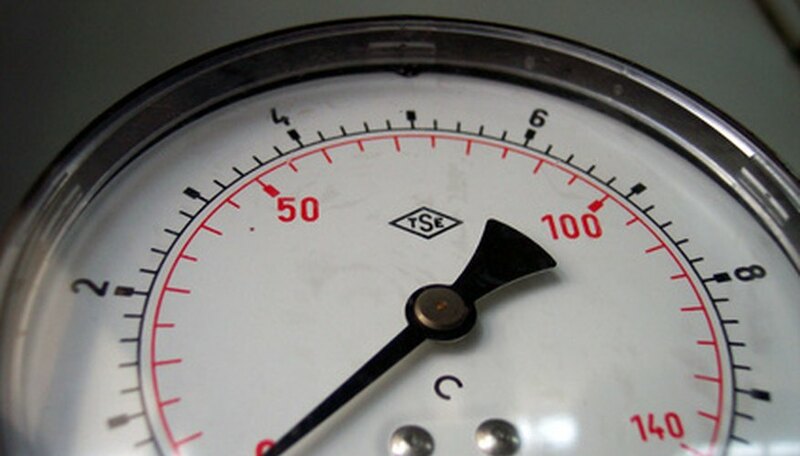 Take the temperature of the system for which you want to determine saturation pressure. Record the temperature in degrees Celsius. Add 273 to the degrees Celsius to convert the temperature to Kelvins. Calculate saturation pressure using the Clausius-Clapeyron equation. According to the equation, the natural logarithm of saturation pressure divided by 6.11 equals the product of the result of dividing the latent heat of vaporization by the gas constant for wet air multiplied by the difference between one divided by the temperature in Kelvins subtracted from one divided by 273. Divide 2.453 × 10^6 J/kg--the latent heat of vaporization--by 461 J/kg--the gas constant for wet air. Multiply the result, 5,321.0412, by the difference between one divided by the temperature in Kelvins subtracted from one divided by 273. Solve the natural log by raising both sides of the equation as powers of e. The natural logarithm of saturation pressure divided by 6.11 raised as a power of e equals the saturation pressure divided by 6.11. Calculate e--a constant that equals 2.71828183--raised to the power of the product from the prior step. Multiply the value of raised e by 6.11 to solve for the saturation pressure. Frostberg State University: What Is the Clausius-Clapeyron Equation? Butner, Sean. "How to Calculate Saturation Pressure." Sciencing, https://sciencing.com/calculate-saturation-pressure-7834338.html. 24 April 2017.